← Board Games for Nepal! The first time I went to Ki Ko Cafe was on a weekday for a late lunch. 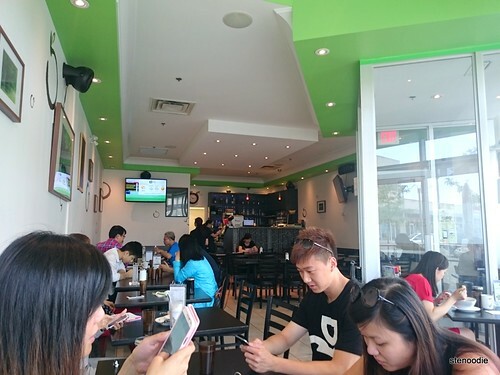 Ki Ko Cafe is located on the northeast corner of Woodbine Ave. and Highway 7 in Markham. 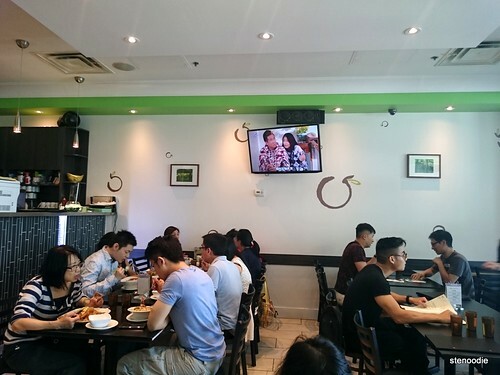 It is a Hong Kong style cafe where a variety of breakfast, lunch, afternoon tea, and dinner is served. 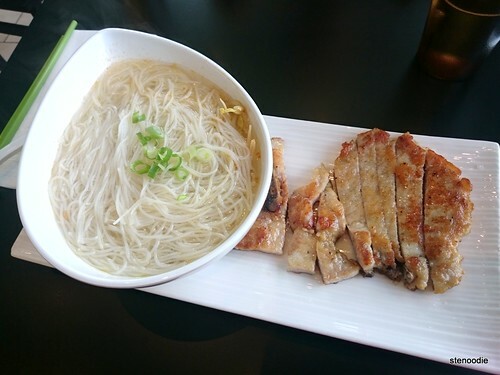 The rice vermicelli came in a tear drop shaped bowl with the pan fried pork chop cut up into strips on the plate. I was actually surprised with how good the pan fry pork chop strips tasted! They were pan fried just right and cut into thin strips that made it tasty and flavourful. The rice vermicelli was good. 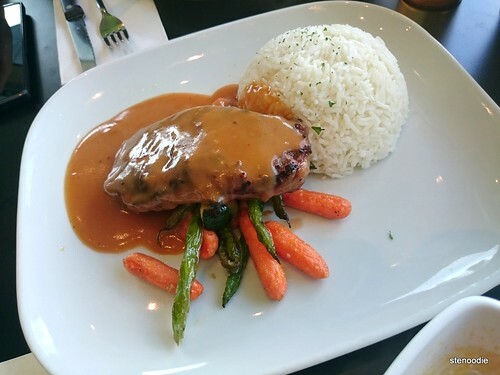 Ronny ordered the Angus Striploin Steak with Rice. Ki Ko Cafe is yet another Hong Kong style cafe that has a decent number of tables and chairs for customers but I can see how it can get really busy. Because of this, I wanted to try it out once more and actually went back the next day for lunch with my mom. 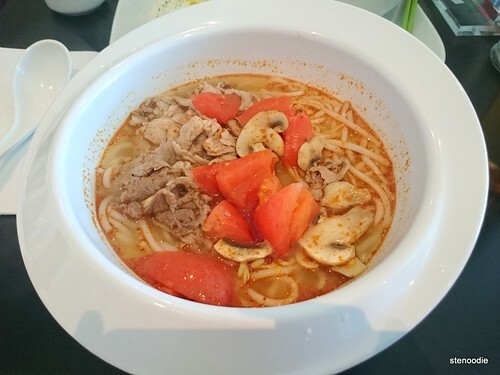 On this visit, we shared the Curry Ox Tongue with Rice and the Tom Yum Sliced Beef with Rice Vermicelli. The Curry Ox Tongue with Rice showed up with a bowl of curry ox tongue separate from the mound of rice. I found that the curry was thick enough and wasn’t too spicy and that the ox tongues were very tender and soft. It was pretty good! 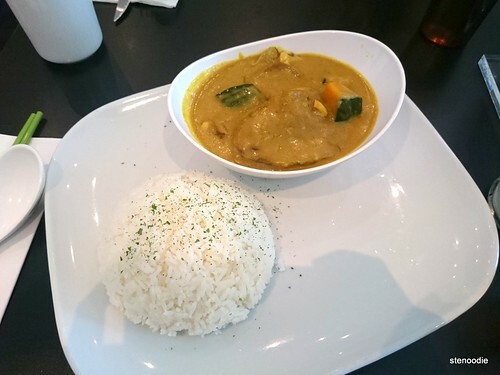 I did find that the curry provided was just enough for the rice and that it would have been nice if there was a little bit more to mix with the rice. My mom really enjoyed the Tom Yum Sliced Beef with Rice Vermicelli. 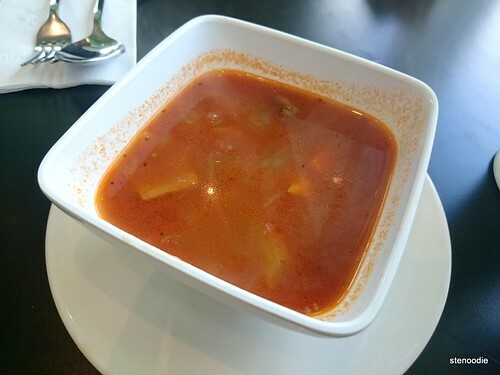 This Tom Yum soup base wasn’t authentic as it was mostly tomatoes that made the soup base stand out. I liked the thinly sliced mushrooms in the soup though! Since we were here during lunch time around noon, there were actually a lot of people here! The whole place was packed and there were a lot of people waiting for tables. In a busy Hong Kong style cafe like this, you have to make sure that you get the server’s attention if you want something. I say this because the table next to us was self-inflicting “terrible services vibes” on the restaurant when they didn’t even get the server’s attention when they wanted to get the bill. It was actually really funny to observe this. 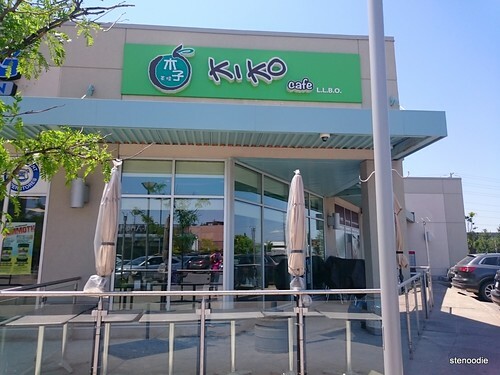 Regardless, have you been to Ki Ko Cafe before? What was your impression and opinion of the restaurant? This entry was posted in Food and tagged 3000 Highway 7 East Unit A2, afternoon tea, Angus Striploin Steak with Rice, Curry Ox Tongue with Rice, food blog, foodie, free wifi, Highway 7, HK-style cafe, Ki Ko Cafe, lunch, Markham, Pan Fried Pork Chop with Rice Vermicelli, restaurant review, Tom Yum Sliced Beef with Rice Vermicelli, Woodbine, 木子茶檔. Bookmark the permalink. That is true! 🙂 Nice observation Andy!